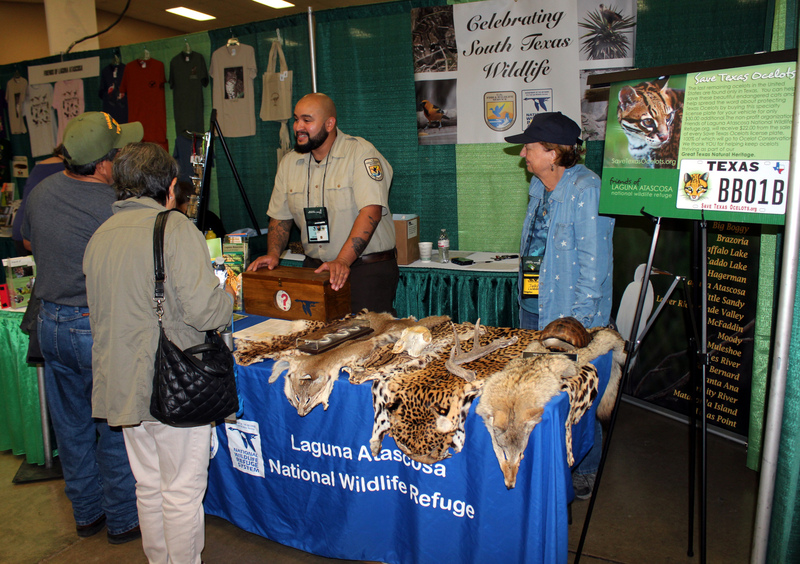 Some 800 birders visited the Rio Grande Valley Birding Festival in November, its 25th year as one of the premier birding events in the country. With dozens of field trips to regional birding hotspots and lectures by internationally renowned birding experts, the festival’s staying power is a testament to the economic impact of ecotourism, and particularly birdwatching, in Deep South Texas. While there are no recent studies on the financial impact of birding in the Valley, a 2011 report by Texas A&M University researchers pegged the number at $463 million annually infused into the local economy. Many local businesses involved in catering to visiting birders, including hotels and restaurants, believe that number is still growing each year. And while much of the Valley’s native habitat has given way to agriculture and urban development over the years, a number of wildlife preserves and refuges consisting of about 144,000 acres have been established to protect remaining fragments of the region’s biodiversity. 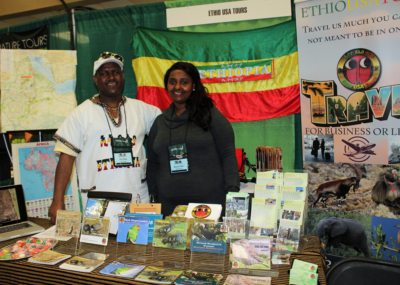 “These protected areas are valuable natural assets upon which the region’s ecotourism activities are based,” the A&M report noted. 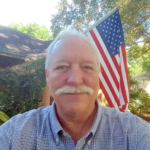 Keith Hackland, a South African native whose bed and breakfast, the Alamo Inn, was established primarily to serve birders, believes that number today is closer to half a billion dollars or more. The numbers behind the birds offer some insight into the why behind the economy of birding in the Valley. North America has about 950 species of birds. The United States has more than 800, and Texas tops all other states with some 600 species. Of those, 500 can be spotted in the Valley, including some tropical species that only venture into the United States at the tip of Texas. Hackland notes that the Valley, where two major North American flyways converge, is at the “center of the heaviest recorded migration on earth.” The high concentration of bird species, including as many as 30 that appear nowhere else in the United States, is like a magnet for birders. 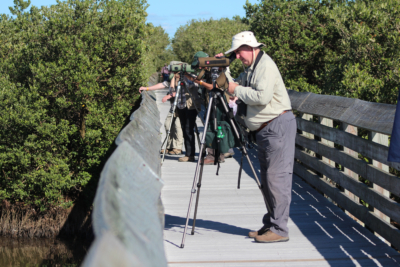 Birding generates millions in revenue and tax dollars, and supports more than 6,600 jobs, earning the region the distinction at the top of the list of the most popular destinations for birding tourism in the country, Hackland said. When Hackland bought three historic buildings in downtown Alamo some 20 years ago, he built his business plan primarily around birdwatching. It was a decision that has served him well. His bed and breakfast primarily hosts bird and butterfly aficionados, many of whom have become repeat customers. “Once they come and experience the Valley, they return constantly,” he said about his patrons and other birders he has met over the years. 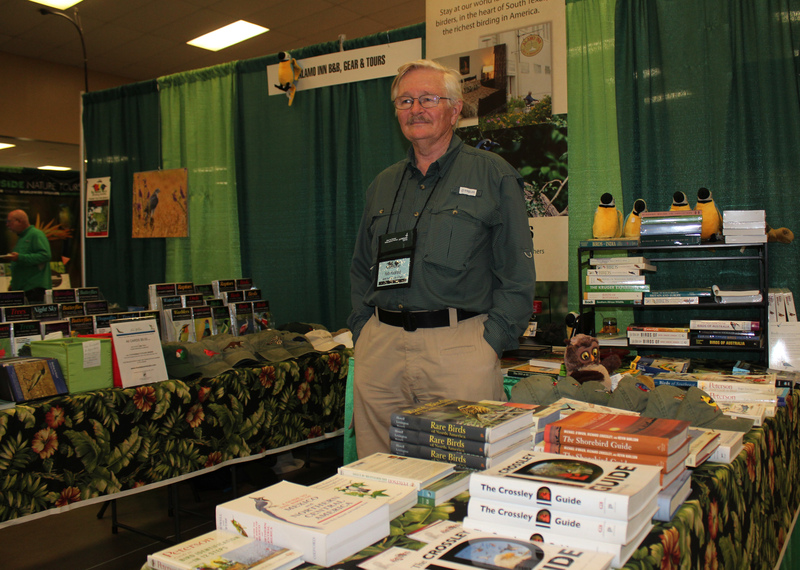 With a booth in the RGV Birding Festival Birder’s Bazaar, Hackland promotes the Alamo Inn and offers books and other items for sale to visitors looking to expand their birding horizons. “Our business model is we do whatever birders need,” he said. 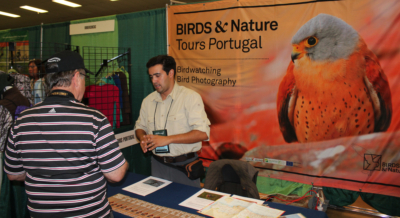 He also acts as a local representative of European birding tour organizers, where he can help visitors to the Valley identify and book far away trips. 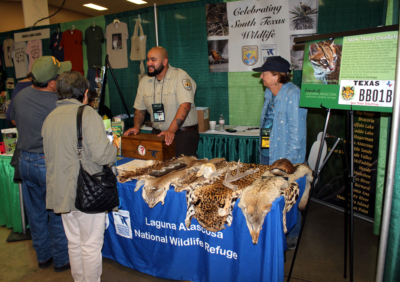 While the birds attract the birders, the birders attract a host of vendors intent on capitalizing on the lucrative influx of largely affluent tourists to South Texas. 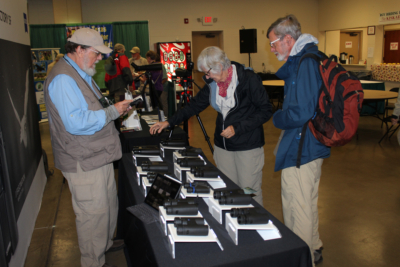 Not only are local wildlife sanctuaries represented, high-end optics companies like Swarovski and Leica present an array of binoculars and spotting scopes that can command prices from several hundred dollars into the thousands. Companies hawking birding and other wildlife tours to far-flung destinations eagerly chat it up with visiting birders. Ethiopian native Abera Abebe, president and owner of Ethio USA Tours, said the RGV Birding Festival is worth the time and expense to pitch wildlife tours in the African country. Other booths promote tours in other parts of Texas, such as the King Ranch, to Central and South American destinations. Conversely, it is easy to find wildlife tour companies throughout the United States and beyond that offer birding trips to South Texas, further bolstering the economic impact in the Valley. WINGS Birding Tours Worldwide, based in Arizona, offers an eight-day Valley birding tour with a price tag of $2,400. “The lower Rio Grande Valley’s remnants of mesquite and riparian woodland harbor an array of species much sought after by North American birdwatchers,” according to the company’s website.